This is a beautiful rendition of the Gran Torino with it’s coke bottle styling and emphasized the on the long hood, short trunk and the radical large egg-crate grille. Mattel captured this and more in this Neo-Classics version in Spectraflame Olive a signature color made famous in the movie Gran Torino. 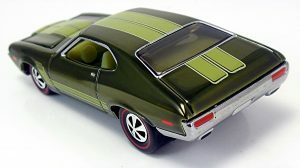 The pale green stripes encompass the hood, roof, trunk, and sides and include all the trim details too. It has a chrome metal base and engine compartment, The hood opens, the first time for this model to show off it’s eight single barrel carburetor engine. This piece is limited to 5000 pieces. 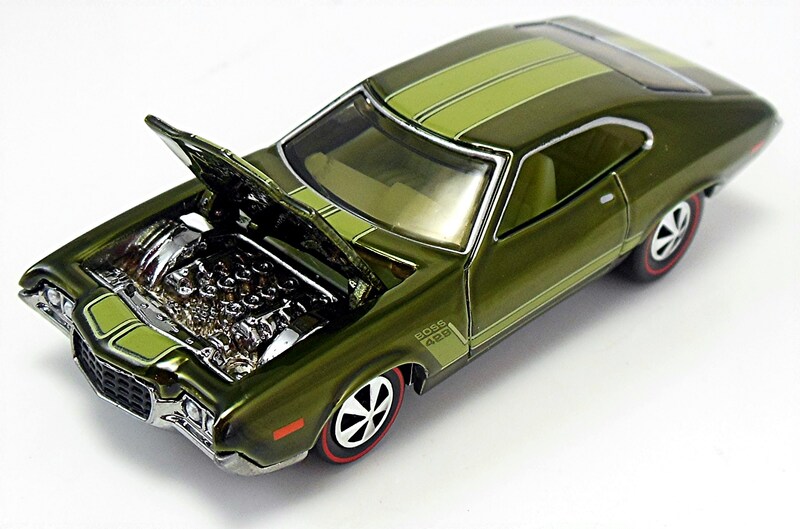 Take look at all the ’72 Ford Gran Torino Sport models issued.